They say intelligent people tend to be more messy. Though I fancy myself as intelligent, I’ve decided I am NOT smart enough to have a messy desk. I can’t think straight when my desk is messy. When I worked in an office building, I had a very clean desk. In fact, I was teased about my clean desk, but I didn’t mind the heckling. I used file folders for every project and every client. One folder out at a time, all refiled by end of day or taken home. It worked! At home, it was a different story. My desk was so messy that when I had guests to my home, I just closed the door to my office. Any rushed attempts at organizing would quickly preclude future hopes of finding anything. It made me crazy! When I started working from my home office, I had a real mess on my hands. I could no longer ignore what was behind the closed door. I found myself unable to focus on any one thing without being distracted by the clutter. The volume of paper on your desk is equal to the amount of anxiety it causes. Vertical: My horizontal stacks of paper were unruly, once I had all my papers sorted in hanging folders (easily accessible in the drawer next to my knee), I could find everything just when I needed it, without even standing up. Methodical: Following all-day events or client meetings, all new notes, contracts, and business cards went into the Sort hanging folder. During the week, I schedule time to work the drawer. Items make their way through the “Action Needed” or “To Read” folders and then onto Steps 3 – 5. Practical: Any flyers, sticky notes, and to-do lists that didn’t fit into my current vision for my life or business were filed in the Later? hanging folder. What wasn’t referenced within 4-12 weeks went onto Steps 4 and 5. Maniacal: Finally, I shredded everything! I mean everything I didn’t need or want. Nothing is more rewarding than watching that machine chew up excess paper clutter! Then, it’s off to the recycle bin. Once my desk was clean, I immediately felt more creative, calm, and accomplished. Instead of staring at the sum of my entire workload, I was able to focus on the specific items and activities that would improve my relationships and my business, today! Not everyone needs a clean desk. But, those who do, need a system to address the incessant flow of incoming stuff! For me? An ordered desk gave me an ordered mind, well, at least a more ordered mind. * Tell me, what’s your secret for battling desk clutter? ** You may enjoy reading other Leader’s Field Guides: Illusion of Productivity and Time Management: My Favorite Misnomer. The post Ordered Desk, Ordered Mind? 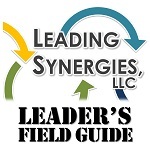 appeared first on Leading Synergies, LLC.